Rhetoric: What is it and why do I need it? | Language For You! Rhetoric: What is it and why do I need it? The term Rhetoric is having a bad time of it in recent years. In common parlance, if something said is insubstantial, people say, “Oh, that’s just rhetoric,” meaning that it’s just hot air. Indeed, this is not at all the real meaning of the ancient word Rhetoric. It is one of our most important human tools for keeping on course, and not being fooled. It is no surprise that just when we need it most, a valuable weapon is being hidden. Originally Rhetoric (Latin: Oratio) designated the skill of informing, persuading, and motivating others toward virtue, and virtuous action. As such, it was highly prized training for leaders, civic figures, lawyers, and politicians. Of course, humans quickly learned that there was good rhetoric and bad rhetoric. The first aimed at exposing the truth, the latter to obscuring it. In order to combat corrupt rhetoric that was being used to confuse, the flip side of rhetorical science, how to dissect arguments to see the truth beneath, and to avoid being fooled, was put into play. Many of the greatest figures of the ancient Greco-Roman world were accomplished rhetors/orators. Some of the most famous were Isocrates (436-338 BCE), Plato, Aristotle (384-322 BCE), Cicero (106-43 BC) , Quintilian (35-100 CE) and John Chrysostom (c. 347–407 CE). Among these, Aristotle and Quintilian were the foremost theorists of Rhetoric, whose works on the subject remain important today: Aristotle’s The Art of Rhetoric and Quintilian’s Institutio oratoria. In pithy Latin, that would be summarized as Bonus orator, bonus vir, “A good Orator is a good man.” Nowadays, we would amend this to say Bonus orator, bonus homo, “A good Orator is a good human being,” since our sense of who can be an Orator is happily more inclusive. Forensics, by the way, is not reserved to CSI. We participated in the National Forensics League–the other NFL–the National association for Speech and Debate competition. Later at Brophy as an instructor I “paid it forward” as Assistant Speech and Debate Coach, and then at Loyola High School in Los Angeles as the head Speech and Debate Coach. While coaching debate in Los Angeles during the late 20th century, the coaches of our local league, all of us veterans of either High School or College Debate or both, decided to stop holding the standard “Policy” debate, since it had become something that had nothing to do with being a good speaker or a good person. It had descended into who could talk fastest and could parrot the most “evidence” provided by their summer debates camps at Universities. Instead, we used a more traditional form, “Lincoln-Douglas” debates to humanize the playing field. The ancient ideals still have power! Forensics? I thought that started with Wojeck and Quincy, M.E.! Now, you may have been wondering…why do both CSI and Debate claim the term Forensics? To encounter the Mystery, once more, we delve into the holographic nature of words and examine where Forensics comes from. Many languages reflect the PIE root d’wer “door,” including Greek θύρα/θύρη (thura/thurē) “door” and the Old English duru (see the German Tür and Tor–for example the Brandenburger Tor, now uniting the to halves of Berlin), and dor, “door.” Our own humble door began life on the banks of the Ganges! 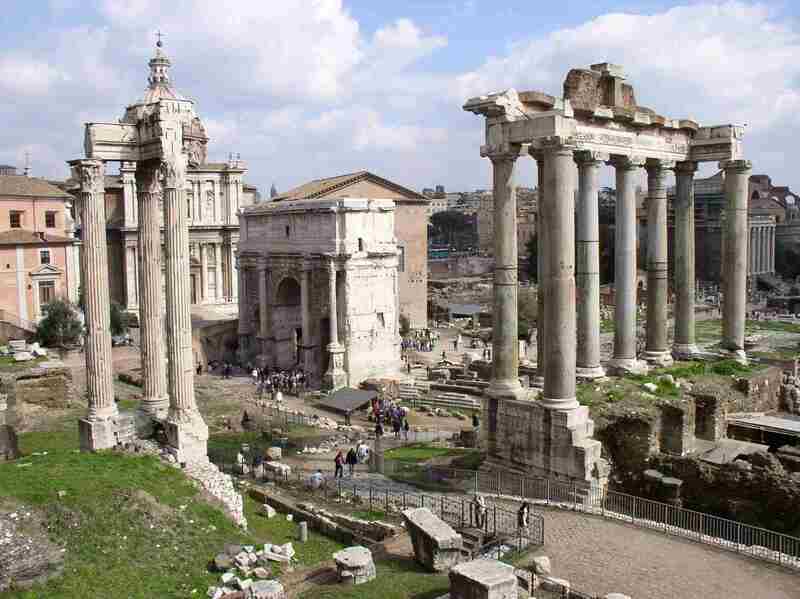 In ancient Rome, legal proceedings were first held in the Forum before the officials and people. The two elements of the trial were evidence (CSI) and Oratory (National Forensics League). That’s how they came together! In the Western European Middle Ages, Rhetoric was part of the Trivium, the first course of University work: Grammar, Logic, and Rhetoric, to be followed by the Quadrivium in the Middle Ages and the Renaissance: Arithmetic, Geometry, Music, and Astronomy. Together, they make up the seven Liberal Arts. The capstone and highest point of the curriculum were then Philosophy and Theology. So why should we care about Rhetoric today? One of the most important tools of Rhetoric’s ability to analyze arguments is called by its Latin name: Cui bono? In the process of analyzing arguments and propositions, one of the key elements to discern just what is going on is to ask: “Who benefits from this?” More recently, in academic circles, this has been called the Hermeneutic of Suspicion. Whatever one calls it, it is useful and powerful tool of analysis and discovery. One last word. In the paragraph above, I used the terms rational and logical to describe the kind of analysis I am promoting. This is much deeper than a kind of cold intellectual process. The two terms, logical (Greek: λόγος–logos) and rational (Latin: ratio) have much deeper meanings than are given to them today, even in dictionaries (notice that I did not link them!). Logos in Greek means Word, proportion, reason, account, utterance, narrative, pattern and balance. It is the term the Neo-Platonists used to speak about the first emanation from The One (the origin of all), which is its image. The Logos is the Divine Image, the pattern through which all of being (including the 11 string multiverse and the immaterial worlds) is emanated. We can hear echoes of this in the Egyptian Memphite myth of Ptah, the Great Honker (thank you Lisa Schwappach-Shirriff) who creates everything by his Word, as well as the Creation of Arda by Eru through song in the Ainulindalë in Tolkien’s Silmarillion and the Creation of Narnia by Aslan’s great growl in C. S. Lewis’s The Magician’s Nephew. Ratio in Latin has a similarly wide range of meanings, especially reason, calculation, proportion, balance. Therefore, to analyze something logically and rationally is to consider it in the light of the balance and pattern of the whole cosmos, material and immaterial, which much of the East speaks of as The Tao. Ancient Egyptians would have called this Ma’at. Kabbalah might use Kether, and all the Sephiroth, the emanation of the Ein Soph Aur (Endless Light: אין סוף אוֹר), which is beyond being and non-being. It means that we compare the arguments we hear to the real and actual pattern of all that is, and see if they measure up. Therefore, we need the science of Rhetoric, now as never before in human history, to keep us on track! All I knew about rhetoric was what I gleaned from “Zen and the Art of Motorcycle Maintenance,” so you’ve added to my understanding. Unfortunately, I hear and read a lot more “bad rhetoric” than “good rhetoric” — especially during election years. Pingback: Light and Truth | Language For You!